Use MERLOT discussion forum connected to the open textbook to write a comment about how you are using the open textbook. Use MERLOT's online Learning Exercise form to share the goals, learning outcomes, teaching strategies, assessment rubrics, and more about how you are using the open textbook. Just type in your text and publish it in MERLOT. 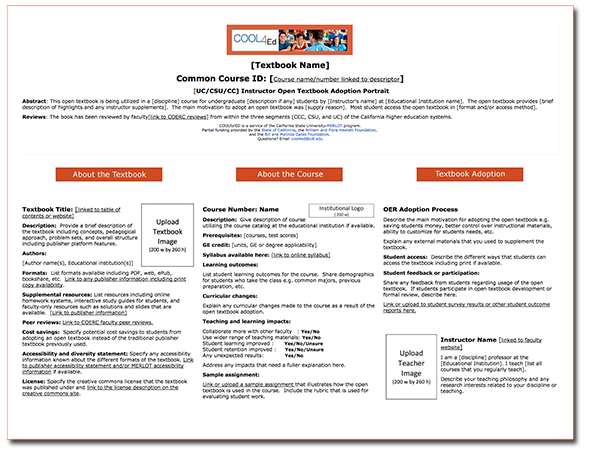 Use MERLOT's Content Builder template to create a rich teaching eportofolio explaining why and how you are using the open textebook to achieve student learning outcomes and include students' reactions and success. Every material in MERLOT has a QR code which makes it easy to share with mobile devices. A QR (Quick Response) Code is a 2-dimensional barcode, which has encoded in it a URL (web address), text, or other information. It can be read by a QR code scanner, including QR scanner smartphone apps. Once you have an app installed on your smartphone, open the app and hold your phone's camera over a QR code to read it. Most QR codes you'll come across have a URL encoded, so chances are when you read the QR code it will take you to a web page.